For the majority, photography has become the most accessible way to capture travel memories. Some complain, however, that shooting photos distracts the traveler from being fully immersed in the moment. We have all smiled at travelers taking endless selfies, shooting out of the bus window, and snapping random shots as they race by. These hardly ever turn out to be great shots that rekindle meaningful memories. This need not be the case, if you take time to stop, survey, and immerse yourself in the scene before you lift the camera to your eye. Use all your senses. Look at the light, shadows, and foreground. Ask what makes this place special to me? Only then begin to take photos. With a digital camera, you have the leeway to shoot many pictures from several different angles. When you view them later, you can show the wide-angle shots first, before following with close-ups. If you take a moment to scope out the scene, your photos are likely to be more memorable and aesthetically pleasing. 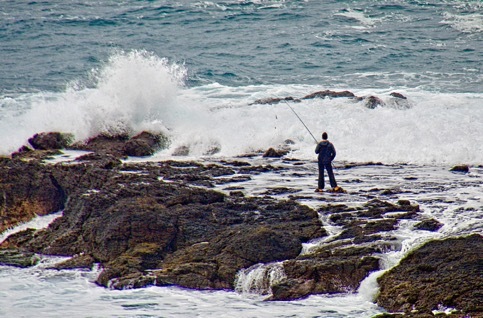 So, when my sister and brother-in-law arranged excursions from Melbourne to the Great Ocean Road of Victoria, on the south-eastern coast of Australia, my husband Boris and couldn't wait to immerse ourselves in nature, and to challenge ourselves to capture the atmosphere of the place in pictures. As we drove along Port Phillip Bay to reach the Atlantic coast, dramatic vistas of the South Atlantic unfolded before us. 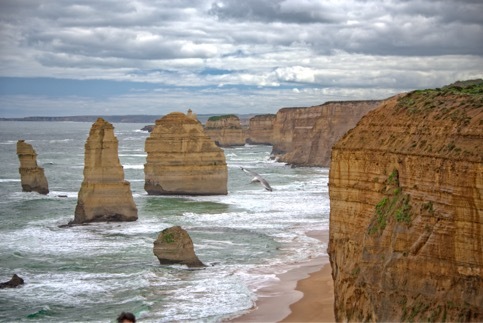 At Port Campbell National Park, we stopped to explore the famous landmark known as the Twelve Apostle. 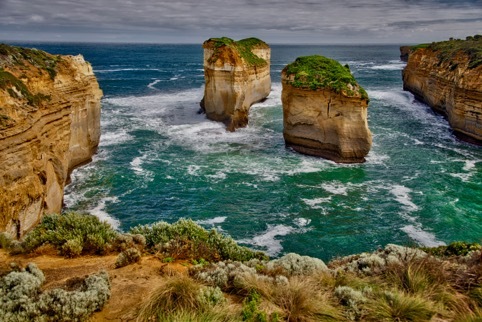 These rock stacks rise out of the waves like beleaguered sentinels guarding an ancient, drowned world. 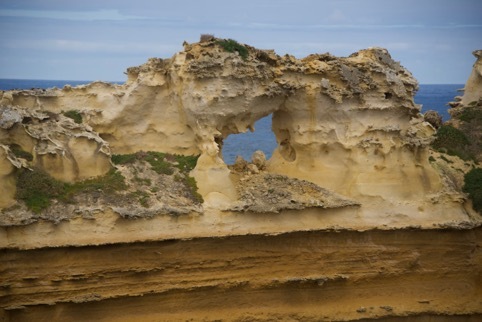 Once upon a time—just a mere 20 million years ago—they were connected to the cliffs of the mainland. The waves and wind chiseled them into caves, then arches, and, finally sculpted them into columns. Only eight stacks remain, in the meantime, the wind and the waves continue to erode the standing columns and to shape new ones. From the cliffs high above the Apostles, I gazed down to the windswept bay, mesmerized by the changing colors of the waves as they marched to shore—from silver grey to jade green and azure blue. My heart pulsed with the breakers ceaselessly rolling to shore. Without warning, a gigantic wave roared in, spewing up a fountain of white water as it crashed into forbidding, black rocks. I stood transfixed, compelled to watch for the next giant wave, and when it roared in, was thrilled to see its mighty power. As I raised the camera to my eye, I framed my shots to best capture the dramatic sweep of the windswept landscape, to convey the ocean’s might, and the swirling foam breaking onto the moonscape rocks. 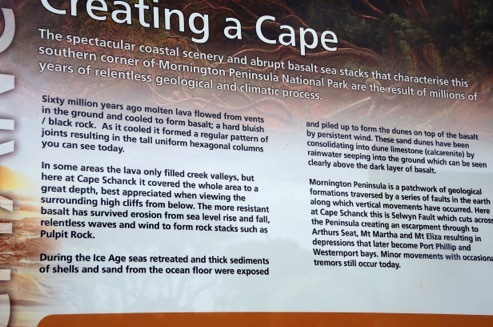 The next day, we came to the mysterious volcanic features, and unspoiled beaches of Cape Schanck on the Mornington Peninsula. Like goats following a mountain path, we clambered down the wooden staircase, descending to the beach. 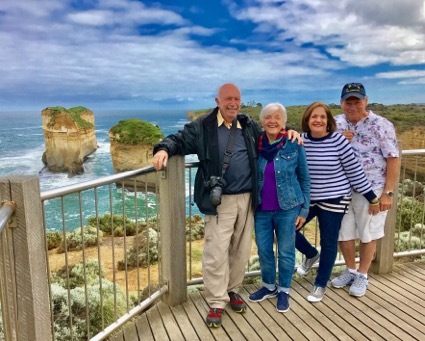 At lookout points along the stairway, we paused to gaze in awe at the twisted volcanic formations, the sheer cliffs, and jagged half-hidden reefs, which combined with the winds of the' roaring forties' and stormy seas to make sailing these waters so treacherous. Small wonder the coast is littered with wrecks. Small wonder that ships wrecked as they sailed towards Melbourne carrying trade goods, prisoners, and early settlers. Even on this fair weather day, I could conjure up the dark side of this place. I could imagine the agonizing terror of the sailors and passengers as their ships sank and people drowned. 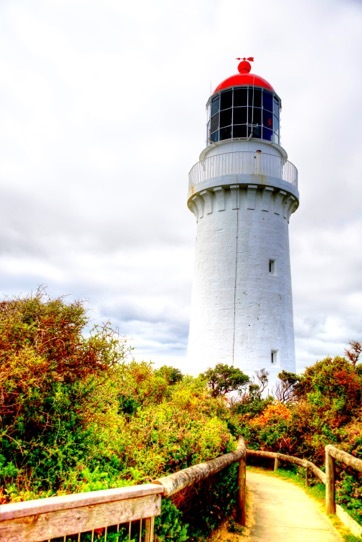 The Cape Schanck Lighthouse, built in 1859, must have appeared as a god-sent beacon welcoming newcomers to Australia after grueling months at sea. These splendid shores inspire and invigorate us.They also humble us. Confronted with evidence of the fierce natural forces that have shaped the land over eons, we glimpse the tiny blimp of our lives on this planet. A happy thought: its took millions of years to shape this coastline, only minutes to set aside life’s tribulations, to relax and immerse ourselves in nature. Your comments are welcome: email me at: cldatnow@me.com Do the photos capture the atmosphere of the place? 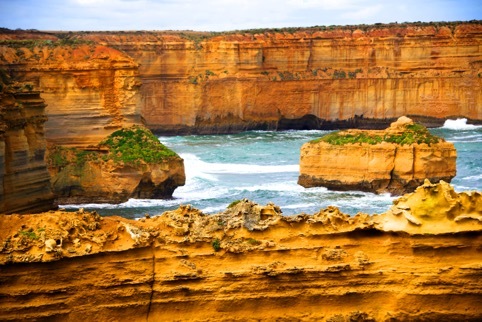 Stay tuned for more about Melbourne and the Mornington Peninsula.